Have you ever wondered why you sleep soundly, and your OH will wake you up with incoherent chatter throughout the night? 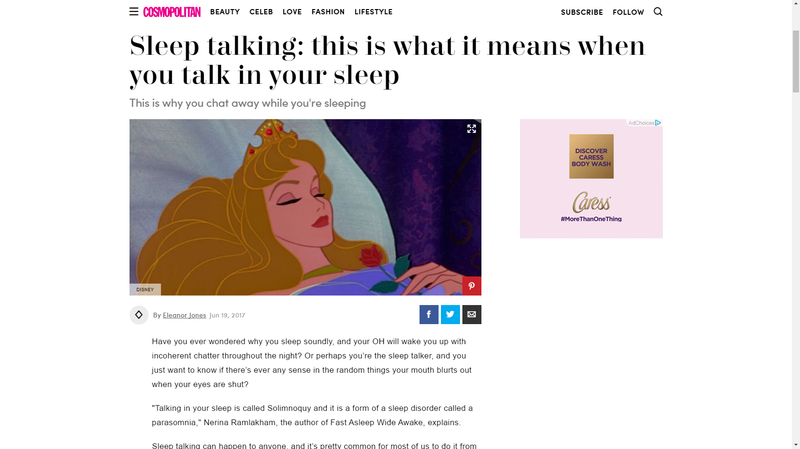 Or perhaps you’re the sleep talker, and you just want to know if there’s ever any sense in the random things your mouth blurts out when sleep talking? “Talking in your sleep is called Solimnoquy and it is a form of a sleep disorder called a parasomnia,” Nerina Ramlakham, the author of Fast Asleep Wide Awake, explains. Sleep talking can happen to anyone, and it’s pretty common for most of us to do it from time to time; some do it when they’re under stress, for instance, or facing a period of anxiety or tension. However, Nerina says that if you sleep talk on the reg, it’s likely that you have a need to express things that you don’t feel able to say during your waking hours, but are still lurking in your subconscious (the slumber-based equivalent of a bottle of white wine, you might say). But if you do want to kick your sleep talking habit to the curb? You’ll need to learn how to express the thoughts and emotions that you need to get out, in a way that feels safe to you when you’re actually awake.